That’s why Youth Futures, a program in Israel was founded and is supported by the Jewish Federation of Cleveland, has joined forces with organizations such as United Way Wraparound Schools, Rainey Institute, Bellefaire JCB, Open Doors Academy, and Esperanza, to support children who are vulnerable – no matter who they are, or where they live. Youth Futures provides community-based mentoring for at-risk youth to improve kids’ school performance, strengthen social integration, and inspire community engagement. "It is an enhanced version of Big Brothers Big Sisters,” said Barbara Leukart, the Federation’s Beit Shean Subcommittee Chair, who works closely with the Youth Futures program in Israel. In addition to meeting with children at school five days a week, mentors also meet with the child’s family, teachers, and social services regularly to get everyone to work together and help the child succeed. "We do a lot to help the child become a better person, but we work with the families as well; we can not do what we do without that work with the family,” said Maayan Feldman, a Youth Futures mentor from Israel. Set goals that are attainable so children don’t feel a sense of failure. Each time a child reaches one of their goals, they will feel motivated to achieve the next goal. “I will never forget the way I felt when one day, my student turned to me and said ‘I succeeded.’ Now we set our sights on making one or two friends at school, and slowly she was able to do that as well,” said Yafit Mula, a Youth Futures mentor from Israel. It’s important that students feel that they have a confidant they can go to when times get tough, from year to year. "We have a group of 7th graders who have been with a mentor since they were in 3rd grade. Having her in their lives year after year has created a level of consistency and stability and has meant so much to them; they rely on her,” said Alison Black, Rainey Wraparound Coordinator at Case Elementary School. Tal Rothstein is the Director of International Programs at the Jewish Federation of Cleveland. 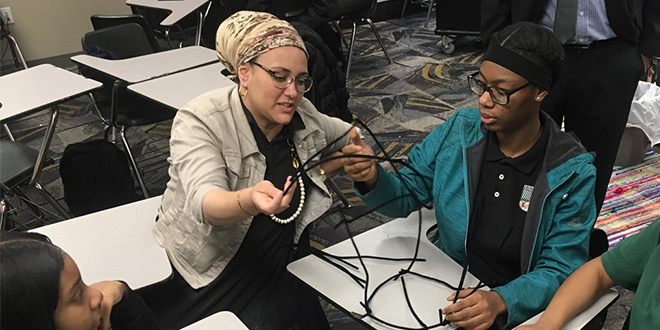 To learn more about Youth Futures and other mentoring programs in Cleveland and Israel, contact Tal Rothstein at trothstein@jcfcleve.org or 216-593-2861.